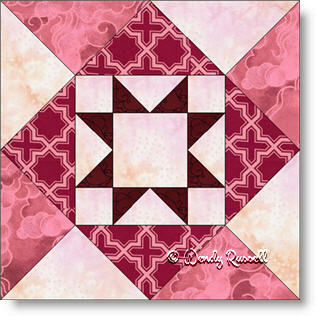 The Sawtooth Ladder quilt block builds on the Sawtooth Star quilt block, which is the focal point in the centre of the block. This centre block is then surrounded by large quarter square triangles to complete the design. When you look closely at the two sample quilts, you will notice that both quilts have the quilt block set on point. However by adjusting where the sashing is placed and the setting triangles, you get a very different look from one quilt to the next.